The tower, which is one of the most impressive works of civil Gothic in the world, was built according to a design of Petr Parléř in the 2nd half of the 14th century by the Parléř’s smelting plant by the St. Vitus temple. The construction was within the responsibility of the sculptor and builder Michael Savoyen, the son-in-law of Petr Parléř and the son of the architect of the Cologne cathedral. After him, both the house and the workshop was taken over by stonemason Petr in 1385, and he completed the tower. Apart from the main designers and sculptors, there were about a hundred of stonemasons working here. 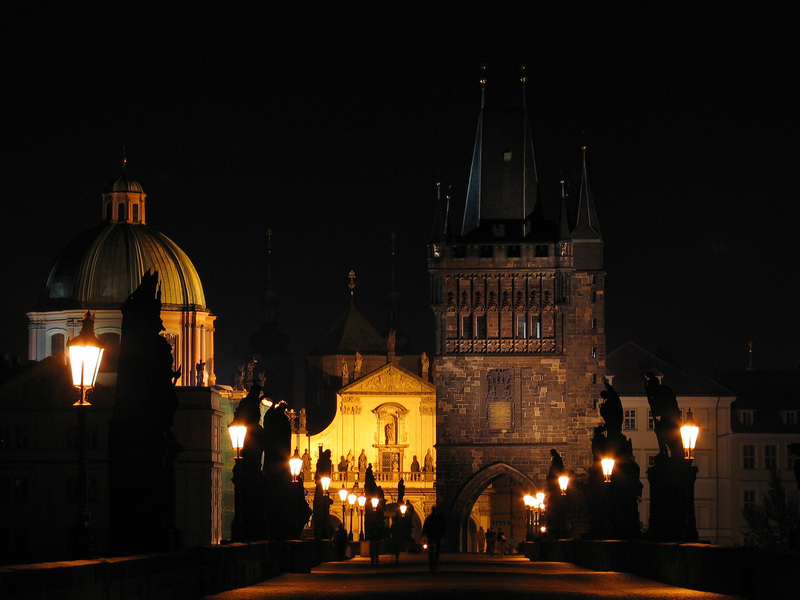 In 1621, 12 heads of some of the leaders of the nobility rebellion decapitated at the Old Town Square (Staroměstské náměstí) were put on display as a warning in the upper part of the tower towards the bridge. The heads remained in place for over 10 years, then they were taken down secretly during the night and buried in place which is still unknown. 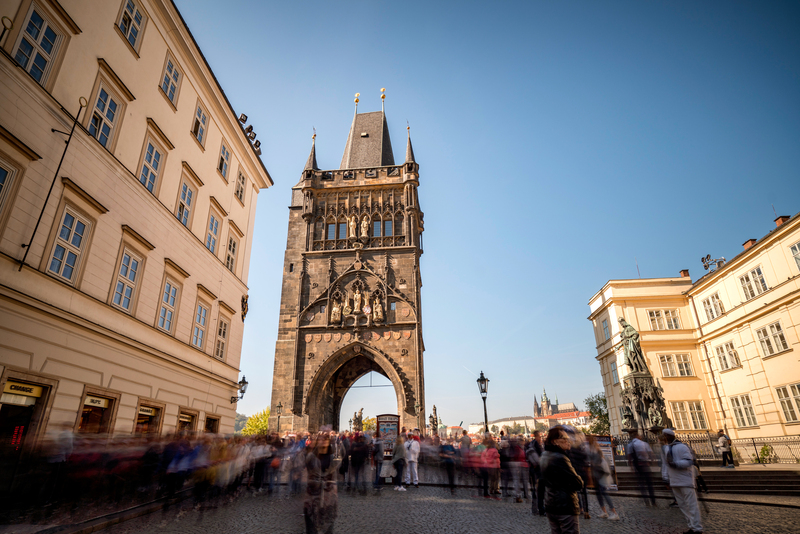 In 1648, the tower was damaged during Swedish siege on Prague, especially the side facing the bridge, which was originally decorated by statues of Madonna on a throne and the Emperor and King Charles IV and his wife Elisabeth of Pomerania. During the subsequent reconstruction, carried out by Carlo Lurago and Giovanni Spinetti in 1650 - 1653, this side was settled by a stone plate with Latin inscription to commemorate heroic fighting of the Prague citizens with the Swedes. A thorough reconstruction took place in 1854 - 78 under the management of Josef Mocker, and it was then that the tower got its present-day roof with four corner spires. Further repairs took place in the years 1952 - 1955 and 1978. During one of these minor repairs, two mysterious inscriptions were discovered coincidentally under the roof, with no spaces between the words and read the same way from the beginning to the end and backwards. Written out correctly, they look like this: Signate, signate, mere me tangis et angis; Roma, tibi subito motibus ibit amor (For your information, a sign, should you blemish me with your touch, you will be strangled; Rome to you at once with upheavals love will be sacrificed). These sentences do not make any deeper sense, but supposedly they contain magical formula of strength and power. They are the so called magical trap - magic formula to scare away evil powers. Similar inscriptions were common on the sacral buildings, namely in Italy. The lowest statues on the tower are placed on brackets completing the gate’s arch. On the Eastern front (i.e. the side towards the Old Town), there is a lion feeding on a rump on the left, and an eagle feeding on a hare on the right. On the Western side on the left, there is the fight of an eagle with a griffin, a mystical bird with an eagle’s head, neck and wings, and a lion’s body, legs and a tail, and on the right, there is a lion fighting with a snake. The griffin was born from a connection of a lion and an eagle, and this symbolism is indicated on the tower in an interesting way: there is a St. Václav’s eagle in a triangle-shaped gable above the St. Vitus statue, and there is the Bohemian lion standing above it on a bracket. On St. Vitus day (15th June) the shadow of the lion’s head touches the eagle’s chest, which at the same time symbolically confirms the connection of Bohemia and Moravia. There are minor comical statues on the tower’s corners about 2 m high: on the left, there is a woman in a gown and a man whose fidgety hand is under her kilt (evil rumours say that it is a depiction of a monk and a nun), and on the right, there is a man trying to explore a woman’s bosom with his hand. Besides the upper part of the gate’s arch towards the tower’s corners, there is a depiction of a kingfisher in a “věník” (a bath towel tied in a knot - the emblem of the barbers’ guild), which is a symbol of Václav IV. Kingfisher is also a symbol of a human soul, as he can protect from a lightning, multiply hidden treasures and calm down storms. This ground part of the tower reaching up to “the height of a horse rider” corresponds to the worldly, sinful world. The next stripe corresponds to the Moon symbolism; there are emblems of territories ruled by Charles IV above the gate on the Eastern side, including Görlitz and Lower Lusatia acquired in 1373, which separated again immediately after his death (1378). That means this decoration must have been done during the life of Charles. Two emblems in the middle are the most important: black eagle in a golden field - Roman emperor and a silver two-tailed lion in a red field - Bohemian king. 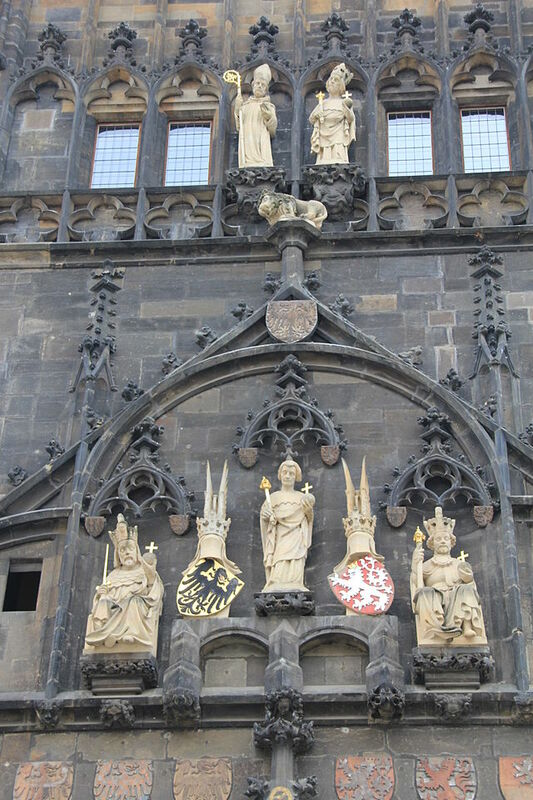 There is a hidden Solar symbolism on the first floor; in the middle, there is a statue of the bridge’s patron, St. Vitus, standing on a model of a bridge, and there are figures of Charles IV (as an older man) and Václav IV (as a young man) sitting on his sides, covered by a triangle gable decorated with 24 crabs - symbols of the 24 hours in a day. Both the rulers have the imperial crown on their heads. Above them, there are figures of St. Vojtěch and St. Sigismund. The statues were made in the period between 1380 - 1400. In 1854, they were restored unprofessionally by V. Linhart and J. Heidelberg. In 1978, they were replaced by copies from artificial stone; the originals are displayed in the National Museum’s Lapidary. On the lateral part of the tower (towards the Convent of the Knights of the Cross), a plate was installed in 1857 with a Latin inscription commemorating the reconstruction of the bridge after the 1784 flood. The passage through the gate, vaulted via a Gothic arch, is 8 metres wide, and there are remains of Gothic painting on its vault, completed by Petr Maixner in 1877 - 78. The tracery vault of the passage is divided into 8 fields by the ribs, which again depict the kingfisher in “věník”. In the lower part, there is a spa girl with a pail in her hand - a reminder of the legend of a barber girl named Zuzana, who rescued king Václav IV from the neighbouring spa, where he was washing himself when he was imprisoned there. In the passage, there is a spiral staircase with 138 steps leading into the tower. The column around which the staircase is winding is concluded by a statue of a tower keeper at the top, which dates back to the 1450s. There probably used to be a guard room on the first floor, from where an iron grille would be lowered to close the gate. 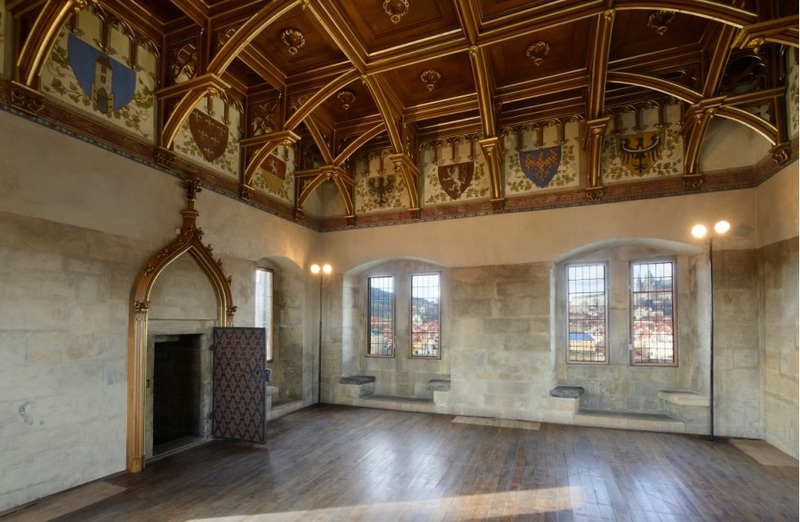 The second floor was used as a prison for debtors from better-situated families, and it has a new-Gothic ceiling from 1880, realized according to a design of architect Jan Schöbl. The windows are decorated with stained glass according to the boards of Jiří Bink. The tower is approximately 47 metres high; the roof with the gallery is approximately 18 m high. In the autumn of 2006, the copies made of poor-quality artificial stone in 1978 were replaced by new exhibits made of high-quality sandstone from Hořice. The statues of St. Sigismund, St. Vojtěch, St. Vitus, Charles IV and Václav IV were replaced, as well as a lion and two helmets. To replace the statues, a unique medieval crane was used, built according to a picture in the Bible of Václav IV by Vít Mlázovský and Petr Růžička from the Ars Tignaria company.